Jimmy: That's Jason. Yep, while you been away, Lois Lane became a mommy. Jimmy: Not sure, some piano mover I think. Jimmy: Seriously, that kid can chuck pianos. Clark: "So, you're a werewolf, and you live in Boston with a ghost and Doomsday?" Jimmy: "In this continuity, he's a vampire." Jimmy: Can you believe thats me before extreme yoga? It's an autographed picture of Captain Carrot. Jimmy "Well Clark when two people love each other very much they will sleep in the same bed and well... nine months later..."
You've been gone 5yrs Clark... the new ones are better, you can even download apps and play games on them. Clark: Wow so we honestly expect people to believe Lois who is played by the chick from blue crush is dating Cyclops and that annoying girly looking brat is supposed to be my son?? 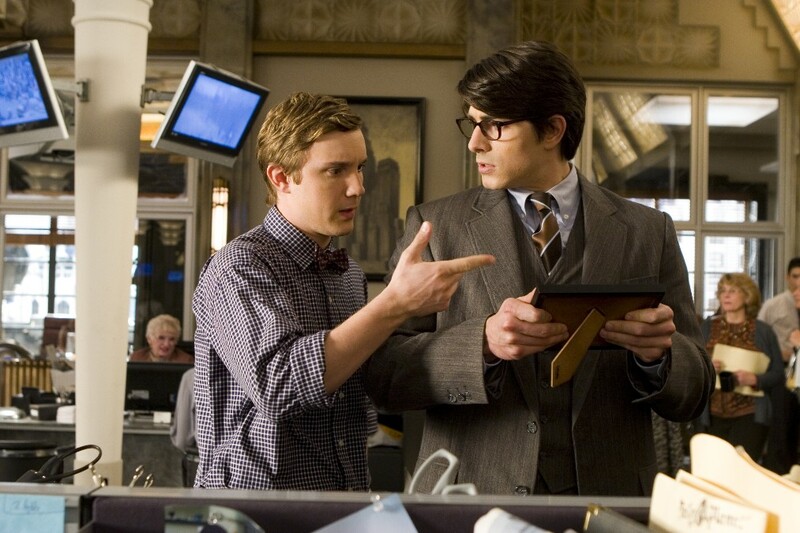 Clark: You wanna bail on this movie and do Dylan Dog? Jimmy: Didja ever notice your reflection looks an awful lot like Bizarro wearing glasses? Clark: "I renounced my citizenship." Clark: "April fool! It was just a one-shot story with no follow up, ever." Jimmy: "Yeah, speaking of that, meet Jason..."
IS THAT A DOG WEARING...A CAPE?